JACKS hit the road at the weekend and went down to Derbyshire for Y Not? Festival, boasting a stellar line-up of the best and newest indie acts around. Arriving at Pikehall, the sun was shining and there was a buzz in the air, the line up for day one was going to get Y Not? Festival off to an explosive start. With The Jackobins, Sundara Karma, Nothing But Thieves, Frank Turner and The Vaccines all scheduled to play, nothing could spoil the day. Maybe except for the unpredictable British weather. It didn’t take long but the most influential performance of the weekend came before any act began, that being the rain. From a drizzle to a haze and a haze to a constant downpour, the rain set the tone for the weekend ahead. The first thing to catch the eye as I entered the arenas was The Big Gin Stage’s screens at either side of the stage. “Due to technical difficulties caused by weather conditions, performances are delayed”. Not a great start, instead of Matt Willis taking to the stage, there was instead roadies with brushes, sweeping water off the stage while the rain blew in on top of them and the equipment. That opened up the chance to get to The Quarry and catch Oddity Road and dry off inside the giant marquee. The Sheffield lads were part of BBC Introducing’s line up for this year’s festival and as the Introducing group have shown time and time again, they know how to pick out exciting local talents across the country. Oddity Road’s loud and infectious sound was thrilling, with a typical hard indie vibe and an unmissable stage presence, the Sheffield quartet blew The Quarry away. Run by This Feeling, The Allotment Stage was beaming with exciting acts to look out for, one being local lads The Jackobins, a small marquee for a band with a big sound. The rain was still pouring outside and that meant those looking to dry off, were about to discover why the next band being added to their playlist were The Jackobins. With their latest single ‘Nightfire‘, along with their other captivating tracks filled with catchy hooks and melodies you can’t help but either thrash around to or sway, it was an exciting performance. The Jackobins go on stage and you can see in the way they perform, it’s not work to them, it’s pure fun and that reflects onto their audiences and did so again at Y Not? Frontman Dominic Bassnett, already performs like a frontman leading a band in sold-out arenas, the question for them is, how long till that becomes the reality. We think it’s not that far away if they keep going the way they are. 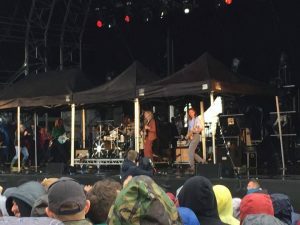 By now Y Not?’s green fields were quickly turning to mud but on the bright side The Big Gin Stage was back on track and in time for Sundara Karma to perform. The stage now had a new addition to its set up with a marquee for the acts to play under, in a bid to reduce the rain hitting the stage. Sundara Karma played in Liverpool last year ahead of the release of their debut album Youth Is Only Ever Fun In Retrospective, at the Arts Club. This October the band will return but to play in Mountford Hall, this is a perfect example of a band on the rise. Their ability to brighten the mood under such difficult circumstances where the last thing you’d want to do is watch a band or a band would want to perform was a true showing of their skill as musicians. 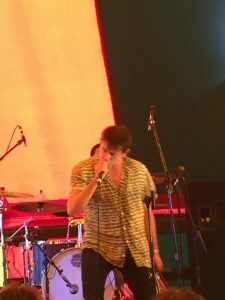 The set saw them restricted to the confines of the marquee but it didn’t stop them from getting everyone dancing, jumping and singing to make everyone forget, if for a short while that they were in the thick of a torrential downpour. Sundara Karma at Y Not? Festival. Another band on a similar path to Sundara Karma, The Hunna have also found themselves on a steady rise in popularity. Lively and passionate, it’s exactly what you want from a band and it’s exactly what The Hunna will give you when they hit the stage. The quartet opened with the heartfelt ‘You & Me‘ and never looked back. The set was a whirlwind of built up angst, sing-a-longs and fast-paced soaring guitar riffs. As they closed with the emphatic ‘Bonfire‘, you’d have began to think, maybe, just maybe, this isn’t so bad after all. Nothing But Thieves continued a good run on The Big Gin Stage on day one, in the middle of touring the festival circuit, previewing their sophomore record Broken Machine, which is due out on September 8th. With massive songs such as ‘Ban All The Music‘, ‘Trip Switch‘ and ‘If I Get High‘, Nothing But Thieves are a band built for festivals with those kind of songs that invoke high energy and big sing-a-longs. The Essex natives are heading to Liverpool’s O2 Academy on November 13th and after their Y Not? performance, we can’t wait. More sing-a-longs will be added with latest single ‘Sorry‘ and the angst-filled, hard-hitting and intense lead single ‘Amsterdam‘ already showing that their album will be a late contender for record of the year. A rain filtered Nothing But Thieves at Y Not? Festival. 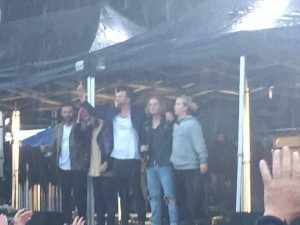 The rain wasn’t interfering with what the band planned to do, which was to come out and make the most of their 40 minutes on stage. Their performance was easily the best on the day as frontman Conor Mason, gave it everything and while the marquee appeared to be like a prison cell for some bands, Conor broke out at the end and went crowd surfing. Clean Bandit were unknowingly at the time going to be Y Not?’s headliners and shortly before they came on stage with one of the biggest turn outs of the day, the screens lit up a message to inform that “due to weather conditions Clean Bandit will be performing a shorter set”. Not exactly what people want to hear when teenage girls have turned brown from mud rather than fake-tan and waterproof coats and ponchos had been rendered useless. God forbid a covered laptop and three “musicians” get a bit wet for half an hour. The set lasted around 20 minutes with the chart-topping hits clearly being the highlight for many of the younger audiences, opening with the infectious ‘Rather Be‘, take that whatever way you like… It continued to be one big but short party for the crowd. Ending with their latest run-of-the-mill chart topper, ‘Rockabye‘ it was a bland performance that would’ve been just as good if their videos were put on the big screen, click play and enjoy, you wouldn’t have spotted the difference. It would’ve been overlooked as they left stage as The Vaccines were expected to be next. Unfortunately the rain picked up intensity and not long before they were due on stage, an announcement was made that the London rockers had pulled out. Maybe we were harsh on Clean Bandit but criticism still stands and also to The Vaccines too. It’s England, it rains and it can rain a lot too, especially in the Peak District. Download Festival has encountered similar downpours and Glastonbury has legendary tales of people and acts coping with the intense conditions. The damage as far as festival-goers were concerned was already done, they could get muddier but couldn’t get any wetter. They were more at risk than the acts so why not go out there, even with a reduced performance and give them what they deserved after the day they had. Luckily one man and his guitar was on hand to step in (no, not him…). Frank Turner, One of the hardest working musicians in the business, if not the hardest working musician. Gig 2075 for the Hampshire man, it was a warming way to close out day one. His passion and the way he filled that stage with just a spotlight on himself as he sang his heart out was a sight to behold. The Quarry was rammed as people came to see Turner show why he should already be headlining festivals. He’s electrifying with his band and on his own he’s surreal. The crowd in the giant tent had flags swaying, voices bellowing every word and it appeared that the disappointment that occurred on the Big Gin Stage was, if only temporarily, forgotten about. 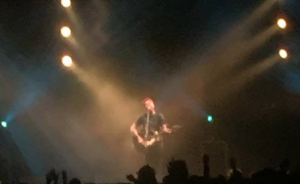 Frank Turner was an uplifting way to end the night and send people on the trek they were to embark on through the thick and dangerous mud back to their tents. Frank Turner stepping in as an alternative headliner at Y Not? Festival. The music on day one was sublime, even the food on offer at the stalls from Duck Burgers to Chicken Balls was mouth-watering. But the safety was a concern already half way through the day and as much as people tried to enjoy themselves, it was hard to escape the overwhelming feeling of “I might be seriously hurt” as the day wore on. 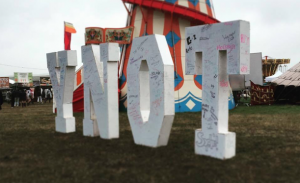 Check out what went down on day two at Y Not? Festival featuring Stereophonics, Declan McKenna, Clean Cut Kid and more by clicking here!